16. 11 18 - WRWS/NRHA - Zuwächse bei NRHA-Futurity-Nennungen. As reiners from across the globe pack to make the trek to Oklahoma City, Oklahoma, for the largest reining horse show in the world, they should be pleased with preliminary entry tallies. 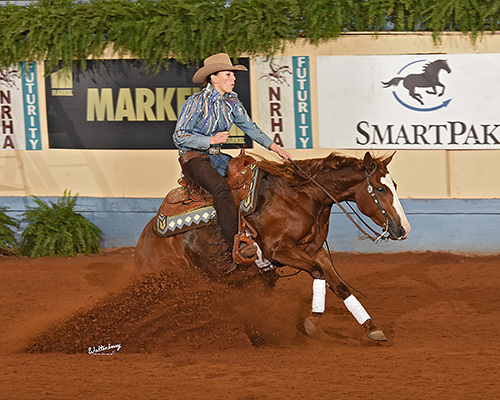 The National Reining Horse Association (NRHA) Futurity & Adequan® North American Affiliate Championship Show promises to be buzzing with significant increases in this year’s aged event entries. Overall, total NRHA Futurity entries in both the open and non pro divisions (levels 1 – 4) are up nearly 11% over final 2017 numbers. In the open, 398 horses will vie for the championship title (versus 370 in 2017), and 200 horses will come through the gate in the non pro (versus 192 in 2017). The following chart breaks down the entries in each level and lists the respective percentage increase. During the NRHA Futurity, the world’s best reining horses and competitors come to Oklahoma City to compete for an estimated total purse and cash prizes of more than $2 million. For more information on schedules, tickets, hotel accommodations, sponsors, and more, visit nrhafuturity.com. 16. 11. 18 - WJ - American-Quarter-Horse-Legenden: „Hollywood Dun It“. Neue Termine im Show Kalender 2019: HorseAcademy. 15. 11. 18 - WRWS/FN - Reining-Jugend-EM: Gold für Junioren und Silber für Junge Reiter. Georgia Wilk neue Junioren-Europameisterin, Bronze für Reining-Juniorin Celine Beisel. 13. 11. 18 - WJ - Im Porträt: ERCHA-Ranglistenerster ERCHA/NRCHA Hackamore Open „Master N Smoke“. ERCHA: Das sind die Ranglisten für 2018 – Schöpfer und „Peptos Lil Bingo“ auf Platz 1 in Open. 12. 11. 18 - WJ - Erste Infos zur IRHA/NRHA-Futurity vom 7. bis 15. 12. 2018 in Cremona: EUR 647.000 Preisgeld ! News von unserem Partner OSWSA: Die neue Winterkollektion – die Winterjacken im neuen Design sind da! Horsense Nr. 5 ist online – wieder mit spannenden Themen! 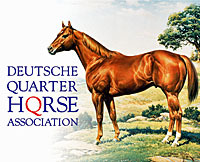 EquiStat 2 Million Dollar Sire „Light N Lena“ ist tot. Das AQHA Rulebook 2019 ist da.